Happy Noi Year! Babe loved his New Year’s Dinner here! We decided to start the New Year with a bang in our new town! 😉 So, we stayed a couple nights at Oxford Hotel… which was a dream and we didn’t have to leave the hotel too often. Though on New Year’s Day, we went out and about to see what was open for eats and sips, then took a little walk in Drake Park. We stopped at Noi, downtown on Franklin and Bond, for early dinner. Hubs had been wanting to take us to Noi ever since he’d eaten lunch their during his interview in Fall. He’s been talking about the ‘Fried Basil on the Garlic Chicken’ ever since! What a better day to do so then on New Year’s with babe in tow!? We love for Bean to experience new eats and cool culture… thus, we don’t really shy away from ‘fancy’ restaurants just because we have a toddler tagging along! Though we do tend to do so during a more low-key lunch versus a more active dinner time. Turns out Noi Thai was, indeed, a super nice Thai place… and very welcoming to little dude! They even have a ‘kid’s plate’, literally, they have the dang cutest little place setting for kids that they break out for the little foodies! Cute little place-setting with colorful bears on it and a kid’s spoon! They, also, have a Kid’s Menu. 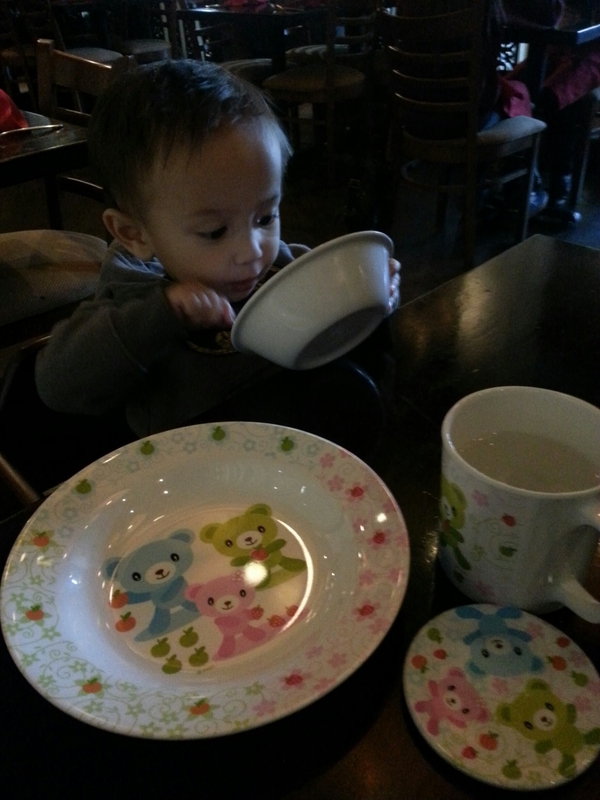 On this, our first dinner of 2014, Bean enjoyed coconut milk soup, rice, chicken, and fried basil! Mama and Daddy enjoyed Coconut Milk Soup, Crab Fried Rice, Crispy Garlic Chicken, Khi Mao Noodles… delish!! As well, they indicate Gluten-Free and Vegan for those dishes that hold these distinctions! Mmmm… can’t wait to go back! Why yes, YES, it was difficult to write this post… now I’m totally craving Thai!